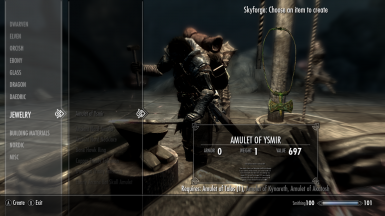 At the Skyforge forge an amulet from the Amulets of Talos, Kynareth, and Akatosh. The power of this amulet is 30% recovery of shouts, the Companion's Insight power from the Dragonborn DLC, the blessing of Kynareth and Akatosh, the meditation of the words of Fus, Feim, and Yol, and immunity to Disease. You can still obtain the blessing of the 3 gods and meditate on the words of power from Paarthurnax. And you don't need any DLC!